Seeking a permanent role within the scientific/preclinical sector immediately after finishing your bachelor’s, master’s or PhD may seem like the most natural step. Traditionally, a permanent position was the expected choice, however, with the changing attitude to employment in the life science industry, there are many compelling reasons as to why considering scientific contract roles at this early stage could be the best way to kick-start a stimulating and fulfilling scientific career. You may have noticed that there is an abundance of contract roles and fewer permanent positions available at the leading life science companies. This is simply because contracting is becoming a major employment trend across the industry, moving decidedly away from the traditional perm model. In life sciences much of the work companies do is project-based so it’s far more effective for companies to employ flexible contract staff to fill a short-term need. Therefore, there are naturally more contract opportunities available across all verticals, not just within scientific and preclinical. Early on in your scientific career, you’ll likely find it easier to get a foot in the door of your preferred area by taking a contract role rather than waiting for a permanent opportunity. This also provides a strong argument surrounding the topic of job security, one of the perceived drawbacks of contracting. However, thanks to this paradigm shift in how big pharma and biotech hire staff, it’s likely that you are in a more secure position as a contractor rather than at risk of redundancy as a permanent member of staff. 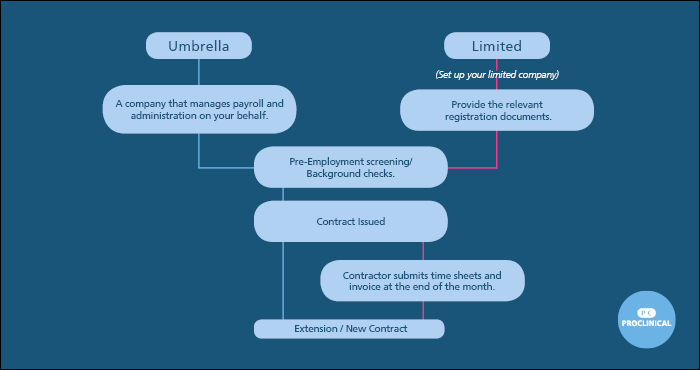 You can read more about job security as a contractor on ProClinical’s blog. It’s important to remember that as a contractor, you can leverage your experience and skillset to charge employers higher rates, meaning you’re likely to be paid better than a permanent employee to do the same job. This is just one of the many advantages of contracting. Some of the best contractor perks include the freedom to choose which companies you work for and the type of project you work on, and the flexibility that comes with being your own boss. You can take as much time off as you like between contracts, or can choose a more steady path by having a string of contracts back-to-back. It’s worth mentioning at this point that despite the changing model of employment, employers do still consider offering contractors a permanent position at their company if they are impressed with their work. Other advantages of contracting include the ability to build up a strong network as you cement relationships with key personnel during each contract, which is a great future proofing exercise. After many years’ successful networking you can pair it with your extensive experience to start up your own consultancy. As with any contract, one of the key advantages for those just starting out in their scientific career is the chance to build up a bank of experience rapidly. As a contractor in the laboratory, you will receive as much training as any permanent employee but in a shorter amount of time, usually around a year. Then with your next contract you will gain new skills and building on previous experience within the contracted time. In a permanent role, it could take several years to gain the same level of scientific experience afforded to contractors who work multiple contracts at different life science companies. Gaining industry experience as fast as possible is crucial in the first years of your scientific career as you will soon realise that working in industry is quite different from academia. This is far more apparent in the scientific/preclinical sector as some of the biological laboratory techniques you learn in academia, such as SDS-PAGE, western/southern blot etc. are largely irrelevant in industry, as most of these procedures are carried out in silico (by a computer or computer simulation). So, you’ll need to gain understanding of the automated processes that are predominately used in the labs. As a contractor you will be trained to use highly-automated and quality regulated methods such as mass spectrometry (MS) and high-performance liquid chromatography (HPLC), helping you to build up the most useful and relevant skills possible. Also, among the most in demand skills in the lab are chemistry/analytical science-based, and include molecular modelling, bacterial sequencing techniques like polymerase chain reaction (PCR) and x-ray crystallography. The faster you can learn these skills the better and contracting is a great way to receive training and gain experience quickly. Building experience through contracting also helps you to diversify. For example, if you complete one contract as an In-vivo Technician at a pharma that specialises in infectious disease, and then another at a specialist oncology biotech you are quickly exposed to a variety of techniques, processes, compounds, automated machinery etc. As there is no particular need to specialise in one specific area so early in your scientific career, gaining exposure to different therapeutic areas and technologies will make you an attractive prospect to employers. Working in different environments during those crucial first years of your career will help guide your decision when choosing a specialism later down the line. In the life science industry, a company’s portfolio often spans multiple therapy areas and is always changing according to patients’ needs, and with a diverse skillset you can support many functions whenever a need arises. This is a strong position to be in as they are highly likely to extend your contract or even offer you a permanent role. Indeed, contracting adds another dimension to your experience. As the life science industry is driven by innovation and technological advancement, contractors have a higher chance of working on projects where they’re exposed to the most cutting-edge compounds and state-of-the-art technologies in development. Early exposure to a new technique/compound that will likely result in patent or high-impact biomedical journal publication, will put you in a strong position in future as other life science companies will value your experience when they look to incorporate similar methods or technology. Worried that becoming a contractor is too complicated? Rest assured that contracting is a fairly straightforward procedure once you get to grips with it. ProClinical has a number of blogs related to becoming a contractor in the life science industry, and our contract team is always on hand to answer your questions about contracting. Interested in scientific contract roles? Upload your CV or apply to any current opportunities to embark on a varied and successful contracting career in the scientific and preclinical sector, where you’ll get the chance to work with innovative clients and cutting-edge technologies.